Treat your hair to System Professional Hydrate Quenching Mist, a moisturising, leave-in treatment designed to intensely condition and hydrate natural and dry hair. Working to improve moisture balance and manageability, the hydrating formula helps to restore lost moisture whilst boosting the efficacy of masks and emulsions to help boost hair's strength and resilience against breakage. Helping to maintain optimal levels of hydration, the mist leaves locks looking smooth, silky and soft. Use alone or add to masks and emulsions. Suitable for natural and dry hair. 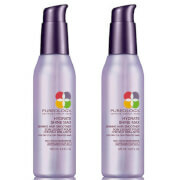 Spray evenly onto towel dried hair as a leave-in conditioner or a finishing step for any System Treatment. Do not rinse, style as usual.